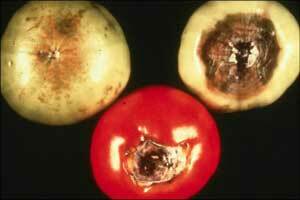 One of the most common tomato problems, blossom-end rot displays a sunken spot on the blossom end (opposite of the stem end) that turns flattened, black, and leathery. It is a serious disorder that can affect up to 50% of the fruit in some cases. The cause is a lack of calcium absorption due to various factors related to soil nutrients and fluctuations in soil moisture. 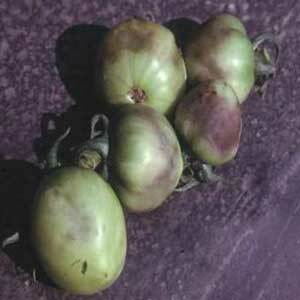 Dry, darkened, leathery patch on tomato fruit opposite the stem end. During ripening stages first appears as a small water-soaked spot on the blossom end. As the spot grows, it turns darker and becomes sunken and leathery. The leathery spot can become flattened. Is caused by a lack of sufficient uptake of calcium. The lack of calcium for the rapidly maturing fruit causes tissues to break down. Moisture fluctuations such as those caused by irregular irrigation can contribute to the problem. Too much nitrogen can cause over-rapid plant growth contributing to the problem. Soils with high amounts of soluble salts can decrease calcium uptake. Avoid large fluctuations in soil moisture by consistent watering (around 1-inch per week is a good starting point). Keep soil pH around 6.5. Add calcium to soil by spreading crushed eggshells around the plant, by applying bone meal, or use agricultural or dolomitic lime, which is readily available where lawn fertilizers are sold. To preserve soil moisture spread a protective layer of a material on top of the soil. Organic mulches such as leaves, grass clippings, straw, bark, and similar materials are excellent and improve the soil. Application of calcium to foliage hasn't proven to be effective. Avoid over-fertilization during early fruiting, especially with ammoniacal forms of nitrogen because excess ammonium ions reduce calcium uptake. Since the problem is physiological in nature, fungicides and pesticides are useless as treatment.